Chachi is convinced that Joanie will leave him when her first love comes back on the scene. Louisa's friend from high school, Vanessa, who is a record producer, comes for a visit and asks the band to play for her. Mario suspects Vanessa is interested in Chachi for more than just his music. The spin-off from HAPPY DAYS wasn't really all that bad, and in fact, had some better scripting than HAPPY DAYS did during that show's lurching final period. The problem was, with viewers having long deserted the mother show, the world did not want a new spin-off of HAPPY DAYS---if they did, they would still have been watching the original show. 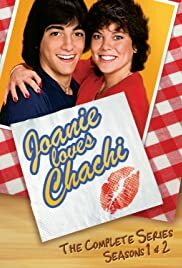 It is too bad that the episodes of JOANIE LOVES CHACHI weren't included in the HAPPY DAYS syndication package. Someone on this board said this has been rerun on TVLand, or some such cable station, but I've not seen it listed. But maybe I'm just biased; as a child and then a teenager so long ago, I had a little bit of a crush on Erin Moran, and would have watched anything she did. She had a nice TV presence, and I'm sorry she didn't get to do much after HAPPY DAYS ended, and doubly sorry this led to her widely publicized "problems" in her adult years. Supposedly she is doing better on that level now, and if somehow she ever reads this, I would like to say that watching her brought some happy moments to my childhood.